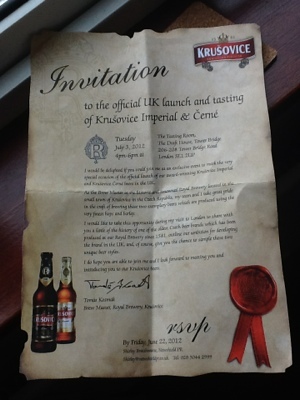 I had a big surprise tonight: I got a invite to the UK launch of two beers from a Czech brewery called Krušovice (pron: Croo-sho-veetcha). By the time I reached the lovely Draft House Tower Bridge Tasting Rooms I was soggy and boiling hot from the muggy weather outside, so gasping for a drink. 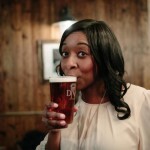 I was handed a golden glass of 5.0% ABV Imperial lager, cold and dripping with tantalising condensation. And after one sip, I couldn’t stop. And though another beer – the 3.8% ABV dark lager – was also being launched (the beers are available in Scotland already) Imperial won the afternoon for me and made a big impression. 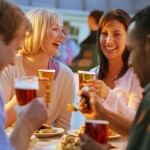 I’m not a massive lager fan: most of the mass-produced ones out there are heavy on the bitterness and light on practically everything else. For me the Imperial was completely the opposite. A touch of sweetness (which made me shimmy) and a soft bitterness which didn’t outstay its welcome in my mouth and a creaminess that made it so gorgeously drinkable: it was a real, pleasant surprise! 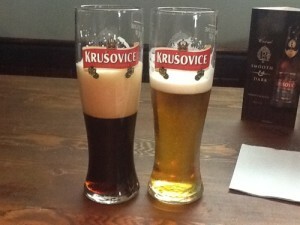 So the upshot is the brewery’s near Prague and has been brewing various beers on the same brewery site since 1581. They are dead proud of that heritage and shouted it from the rooftops at this event: ‘Brewed for Kings’ is one of the taglines because they say it’s the only brand that was ever owned by the Czech Royal Family. They had it for 100years and to this day the spring water they use in the brewing process comes from wells still owned by the Royal estate. Nice history. They were bought by Heineken in 2007. The all-star video cast features Tomás, Christine Cryne (National Director, CAMRA), Pete Brown and Nathan Nolan! The dark lager (pronounced Chernay) was a little too low ABV for my taste though the description of darker, sweeter and maltier in that maltloaf kinda way had me hooked before it hit my lips so I was expectant. Sadly it didn’t deliver what I was after: I got lovely roasted malt and strong coffee beans on the nose but it lacked the sweetness and the mouthfeel I craved. It tasted almost like a weakened stout but hey ot to say I won’t give it a second chance: I’m just not used to dark lagers. So my cute little gift pack gives me that option! Cheers, Krušovice!! If you see it on draught or in bottles around and about, go try some, especially the Imperial cos that is proper LUSH!!!! 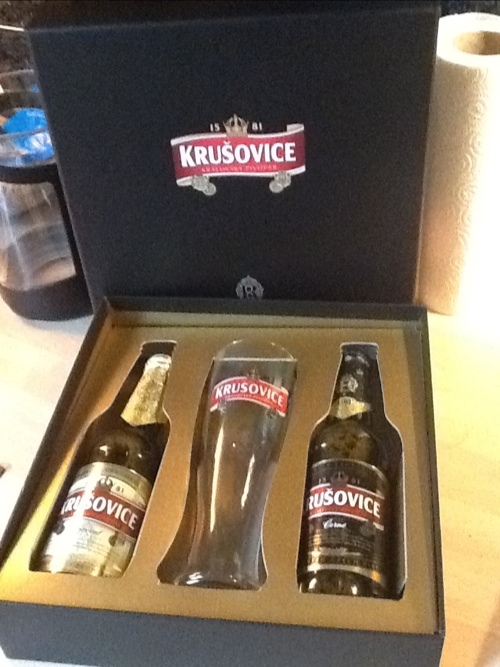 I have been drinking Krusovice for some years now and supplies in the UK have become none existant!!!! If anyone knows where I can purchase in UK I would be very grateful. BnM Stores are currently selling the Dark Kosovice for the ridiculous price of 49p per 500ml bottle. First time I’ve tried it…very nice. Look on the net for your closest store…got mine in Peterlee, County Durham. Hope this helps. Wow! That’s amazing! I’m more a fan of the Imperial but if you’re loving the Dark, then keep filling your boots at BnM!!! Cheers for the tip!! !